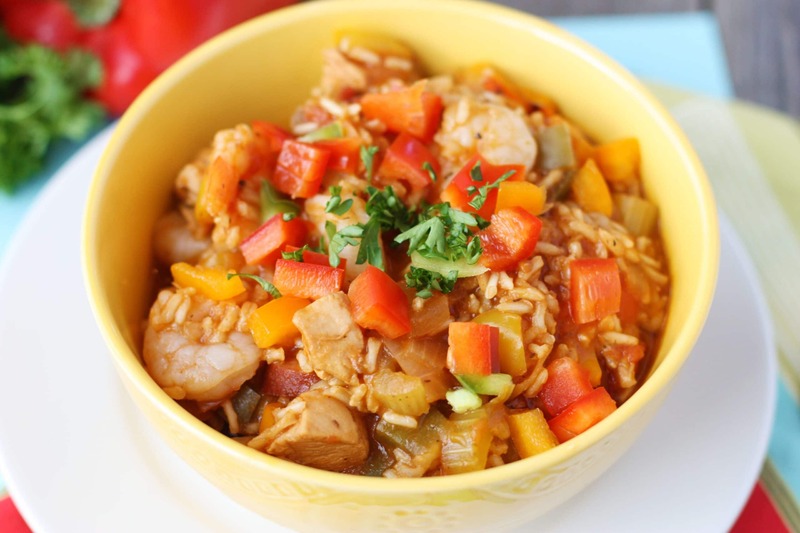 When I think of Jambalaya, the words quick and easy, would not typically come to mind. Not until I made this delicious and flavorful version. 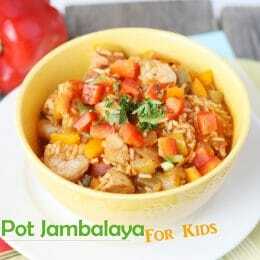 Typical Jambalaya can be really spicy, which is not appealing to most kids. This version still has the yummy Jambalaya flavor, just with a more mild heat making it the perfect veggie packed dinner for kids. Plus you will not believe how fast this meal can be whipped up. The best thing about this recipe is that you only use one-pot. For everything. 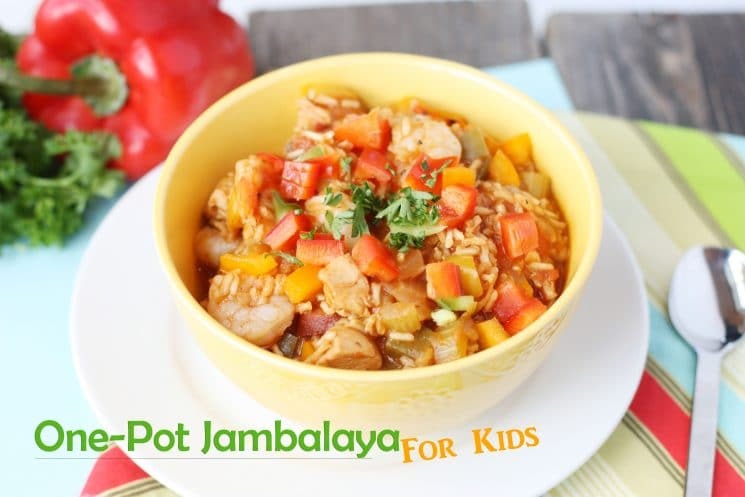 One-pot Jambalaya Recipe for kids will definitely be on your menu! When I make one pot meals, I use my reliable, amazing dutch oven. It cooks evenly, transfers from stove to oven perfectly, cleans easily, and it is just so pretty 🙂 Begin by placing your oil and veggies in the pot and sauteing until tender – about 5 minutes. Add your protein. Typical jambalaya calls for chicken, sausage and shrimp. 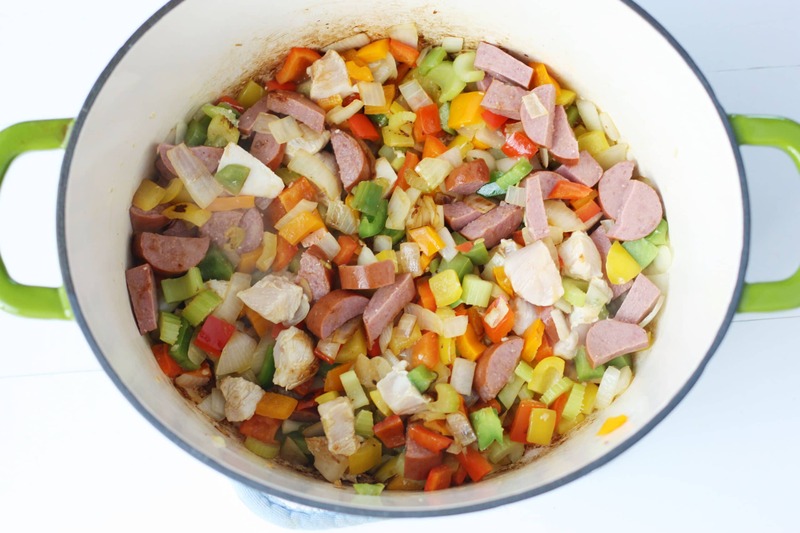 That is what our recipe uses, except we use turkey sausage just to lighten it up a bit. We don’t eat a lot of meat and so I put less meat in than a typical recipe. After the protein comes the saucy goodness. You can use diced tomatoes in this recipe, but I like creamier texture of crushed tomatoes. Add the rice and then you just let it simmer and soak up all of the yummy flavors. Once the rice is soft, then you add the shrimp. Because of the tender nature of shrimp, it does not need to cooked for very long at all. 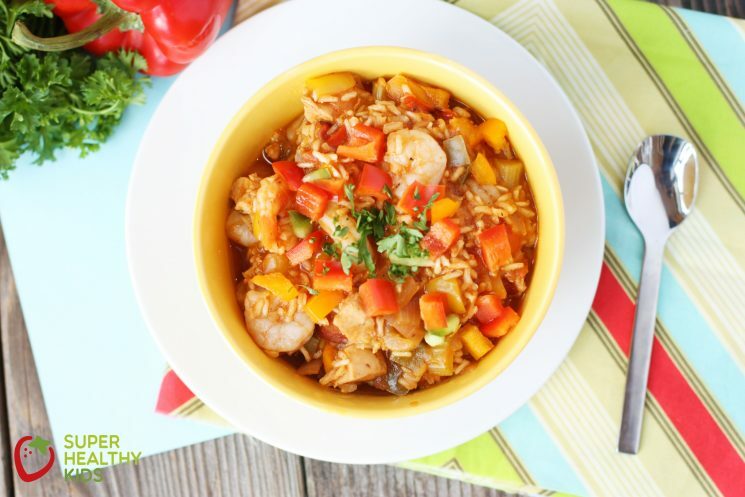 Jambalaya is full of flavor, healthy veggies, and is a warm comforting meal that your family will want to serve month after month. 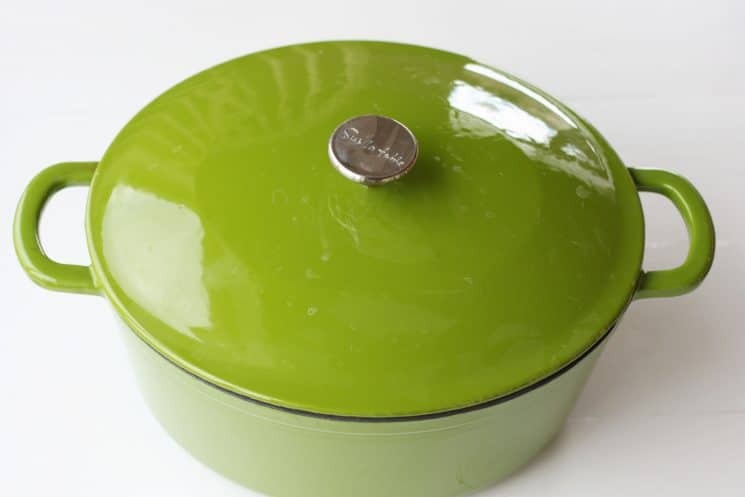 Heat olive oil in a large dutch oven or sturdy pot. 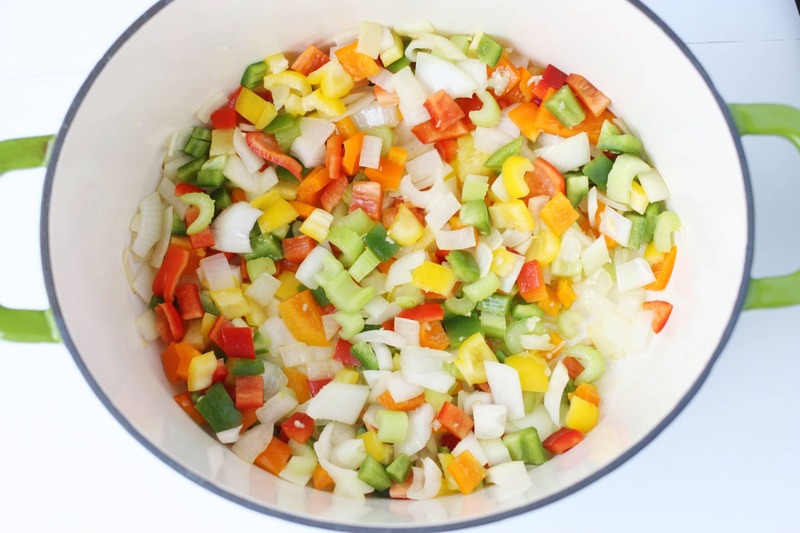 Chop onions and peppers into bit size pieces. Mince or crush garlic. Saute veggies and garlic until they soften, about 4-5 minutes. Cut chicken and sausage into bite size pieces. Add the chicken and the sausage and continue cooking until chicken is no longer pink on the outside. To the pot add the rest of the ingredients, except the shrimp. Stir to combine. Decrease the heat to medium-low and simmer for 30 minutes. Once the rice is soft, taste and add more seasonings to taste. Add shrimp and continue to simmer until the shrimp are pink and cooked through. Made this tonight and it was easy and delicious! A big hit! Thank you!!! This was a huge hit tonight!! My oldest daughter found this recipe and we gave it a try. Such great flavors, not a lot of spice (that can easily be added to individual portions as needed), but everyone at the table loved it!! Thank you for sharing! 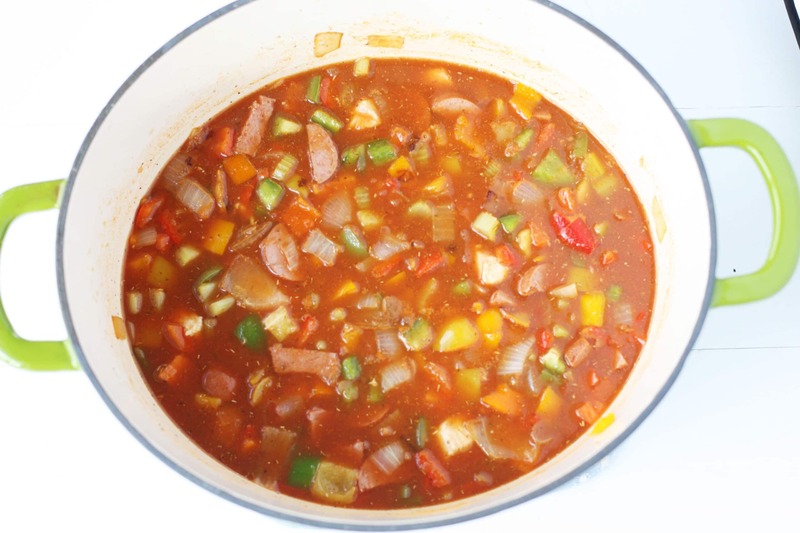 Thank you, Natalie, for a great kid-friendly version of Jambalaya! It turned out perfect and the kids really enjoyed it and I am not a great cook. I look forward to making this many times in the future. God bless. My family loves this recipe. We make it monthly and have been since finding this post a few years ago! It freezes well, although I don’t usually include shrimp. A few times we made it vegan by using veg. broth and beans instead of meat, for one of our family members. Awesome! Thank you for sharing, Janet.